Each of the groups had been assessed in July by Royal Horticultural judges. At this ceremony they received their non-competitive gradings, reports and prizes from Councillor Piara Singh Clair (Assistant City Mayor – Culture, Leisure and Sport). It was an opportunity for people to learn about all these groups and their achievements within the City. Evington was well represented by seven IYN groups and Evington in Bloom. The old kitchen garden in Evington Park is being tended by the group every week throughout the year. We are pleased to see newly planted features and hear your plans to enhance other areas within the coming months. 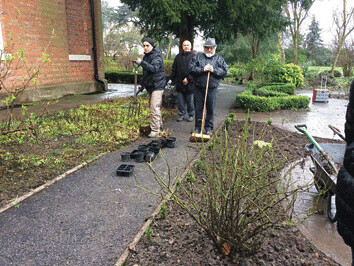 This group is led by a dedicated volunteer and supported by other group members and Leicester City Council Parks. We look forward to seeing the group membership increase in the coming months. The very features of the garden offer a home to a wide variety of invertebrates and birds. New heritage roses have recently been planted by volunteers to replace other planting and are surrounded by mature box hedging. The Burnaby group has ideas to further enhance the site with new plants. The enthusiasm of this group shines through. They work along a very busy road and undertake a variety of tasks to improve the local environment. Activities are around Downing Drive, Sedgebrook Park, the Bushby Brook and a garden at the Church of God. The group have good links to Evington in Bloom and the neighbouring Evington IYN group and share a mower. Perhaps the group could find an innovative project that would catch the imagination of students at the City of Leicester College and get them involved. The group have regular litter picks. They are responsible for testing the water in Bushby Brook and waterside care. The Hi-viz vests are a great way to publicise. Plants and tubs provide an attractive frontage to the shops. A knee high rail and associated planting have proved a very worthwhile project. Betty and Philip have created their own garden of Eden at the Church of God which includes a mixture of shrubs, herbaceous plants and fruit trees. A long term project which has huge potential to become a major feature within Leicester. A former moated Manor House dated around 13th Century is said to be one of the best ancient monument complexes in Leicestershire. Friends continue to work with the local authority and other relevant organisations to develop and preserve this historic site. Changes in operational activities over the last 12 months have affected the progress of this group. Habitat surveys, information boards and further recruitment of wildlife volunteers are planned for the coming months. Friends have developed significant partnerships with Leicester City Parks Conservation and Archaeology sections. 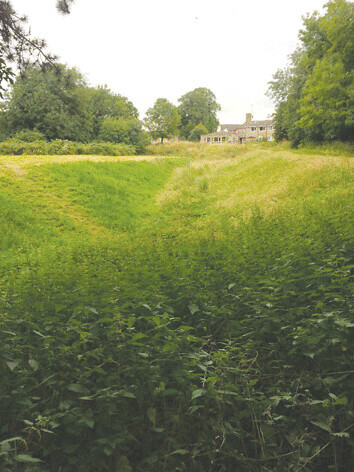 Piggy’s Hollow is both a scheduled Ancient monument and a designated wildlife site. The site is well maintained by volunteers with no evidence of litter, graffiti and other detritus. Waste materials are removed from site for recycling. Further habitat surveys are planned. Paths are well maintained,. The present site is cut on an ad hoc regime, which needs reviewing. Brambles on site need addressing and a stronger management plan is needed in order that the volunteers and the City Council can work in unison. An inspirational project full of innovative ideas and elements. You can’t visit without being inspired and motivated to become involved. This is a venue for all to contribute, including the homeless. It brings many people together with different skills, to great effect. Along with bee hives, the site now has a large water feature. Peripheral areas of the garden have been planned as wildlife corridor. The site collects rainwater and composts. It is lovely to see your project progress and amazing to see what you have achieved on this sloping site. (at The cabin is an excellent facility for classes, activities and shelter on rainy days. 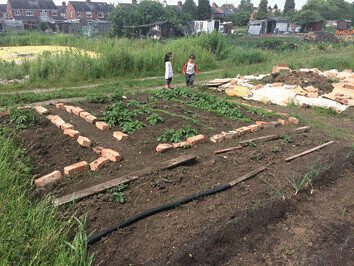 TCV (The Conservation Volunteers) initially started this project with Friends of Evington who acquired funding from LCC for a polytunnel and funding from Awards for all (Lottery funders) for a site cabin for workshops and gardening courses. Good partnership working. Rainwater collection and composting. A small water feature. Recycling old drums and wooden pallets. Some raised beds have yielded crops. The group plan to raise seedlings for crops on site and grow flowers for the Evington in Bloom campaign. They are planning a forest garden. 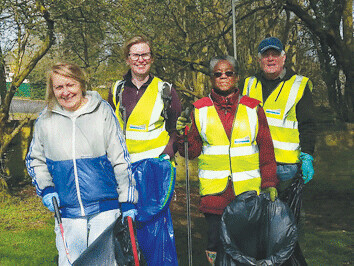 Based around the Village Green, the group takes on a variety of tasks to help improve the look and feel of Evington Village Centre for the benefit of residents and visitors alike. 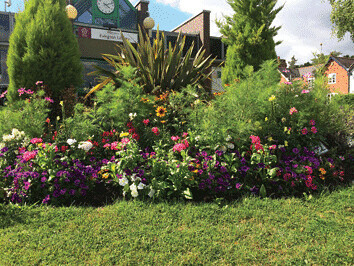 Individuals and groups take on particular aspects of looking after an area from the Village Hall to the planters along Main Road, the Coop bed, to the herbaceous bed within the Village Green. Strong links with other groups have been formed. Residents are kept informed by noticeboards. The Evington Echo greatly assists with particular activities. Planters use a variety of material, often recycled, that creates an interesting mix. 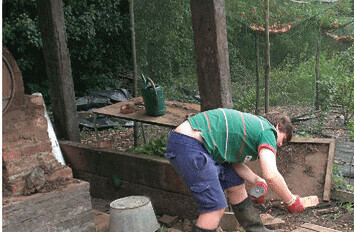 Peat free compost is used. The area is regularly litter picked. Some areas on the Village Green are being developed as wildflower meadows – could link with the Urban Buzz scheme. A surprising number of beds and features are packed into this area. Outside the library the bed is open and attractive. Under the hedge it is a subtle herbaceous border, all well maintained. Some containers, such as those outside the Coop and Village Hall contain edible crops. 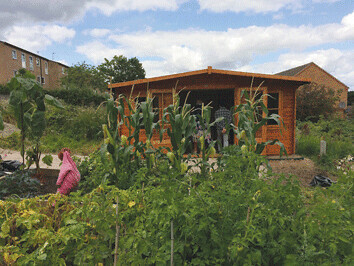 Your first year onsite (Ethel Road allotments) and entering IYN. You made a good start and it was wonderful to meet you all and hear of your plans for the future. This is an enthusiastic group with a mix of ages and abilities who share knowledge and skills. The group has started composting. There were successful potato and bean crops this year.